As we bid farewell to Thanksgiving, everyone turns their attention to the holidays. With Christmas just around the corner, many folks are focused on prepping their homes for the most wonderful time of the year. Take a look at the best Cyber Monday deals we have in store for your home. A festive entryway or foyer conveys an attractive, welcoming atmosphere. Aside from making sure your foyer has plenty of space for your guests’ coats and shoes, you’ll also want to greet them with something to set the mood for your holiday festivities. Kindle the holiday spirit with the classic beauty of our Balsam Spruce Wreath & Garland on your door or in your entryway. Placing some potted trees by the foyer gives your guests a warm welcome as they enter your home. Our delightfully petite Lewis Pine Potted Christmas Tree has the right size to fit any space. They are also decorated with pine cones and red berries that add a pop of color to your décor. A classic full-shaped Christmas tree like the Columbia Valley Fir, Alaskan Grand Fir, or Balsam Spruce for the family room is perfect for gathering both family and friends together for a holiday celebration. 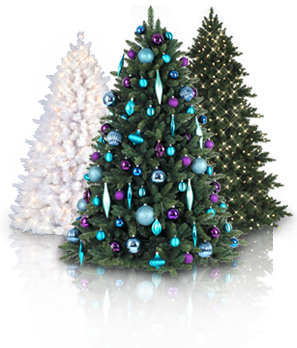 These trees look great whether with minimal decorations or fully decked out with your favorite ornaments. Small festive touches can make a huge difference to your living room. If you’re going for the rustic look, the Kennedy Fir wreath and garland will look wonderful on your wall or mantel. For that classic Christmas style, the Mixed Mountain Pine wreath and garland is a great choice. Going for a White Christmas theme is a fantastic way to bring the charm of the snowy outdoors right into your home. Our versatile Flocked White Fir Wreath & Garland and Shimmering White Christmas Tree provide a delightfully festive atmosphere throughout your home, whether decorated with a few hues, or adorned with trimmings in a wide variety of colors. If you’re thinking of breaking out of the traditional green or white trees this holiday season, we’re also offering great deals on our Jet Black, Midnight Blue, and Golden Glow Christmas Trees. Aside from their unique color, these trees are designed with a slender profile giving you the freedom to display even in tight spaces. Update your home décor for the holidays on any budget without compromising on quality. Visit ChristmasTreeMarket.com to check out our Cyber Monday deals and make your Christmas decorating dreams come true—for less!